Luxurious accommodation in the Kalahari, Northern Cape, Van Zylsrus, South Africa. One of the small five of boutique hotels and a "must visit" on your bucket list! 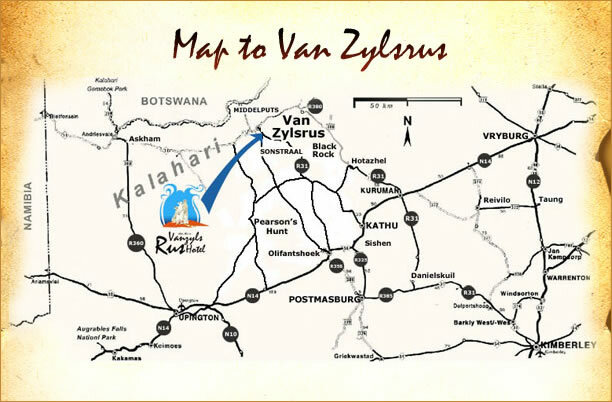 A pioneer and entrepreneur started a small shop in Vanzylsrus in the early 1950’s to cater for local farmers and travelers who passed through this town on their way to Botswana. Tired travelers were seeking more than just a shop and soon rooms were added to provide shelter and food. A liquor license was obtained and this lodge entered an era of growth, becoming a hotel of note. The hotel traded under the name of “Gemsbok Hotel”. Many tourists, hunters and travelers would still have interesting stories to tell about the old hotel. In 2006 the new owners saw potential in this small Kalahari town. They purchased the then “run-down” hotel, demolished the entire place and the new jewel and oasis of the Kalahari was born – transforming some of the debris into art which can be viewed throughout the Hotel. The new Hotel opened its doors to the public in December 2007.